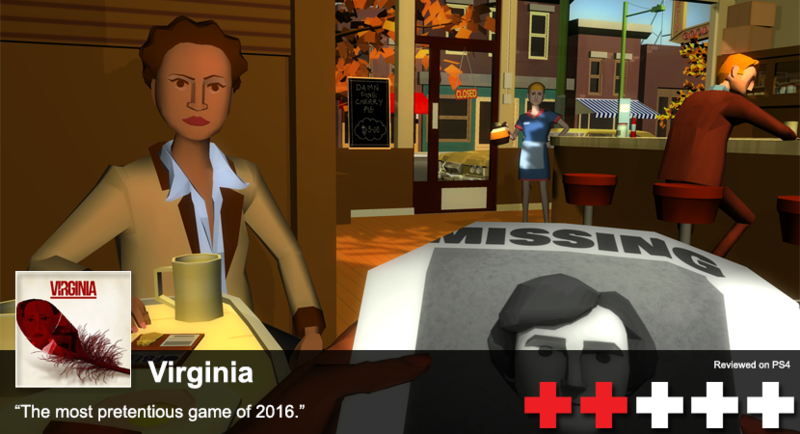 Virginia is a a first-person adventure game about an FBI agent and her partner solving the case of a missing boy. I think. By the end of it, I really didn't know what was going on. There's definitely some deep meaning behind everything that I saw and haven't bothered looking into. The reason the plot is hard to explain is because it copies a formula known as Lynchian—a term used to describe the similar story telling style of acclaimed director, David Lynch. David Lynch created the incredible Twin Peaks television show and several films over the years such as Moholland Drive and Eraserhead. His works are never straight forward and have hidden meaning in practically every scene and dialog. It's not for everyone, and neither is Virginia. 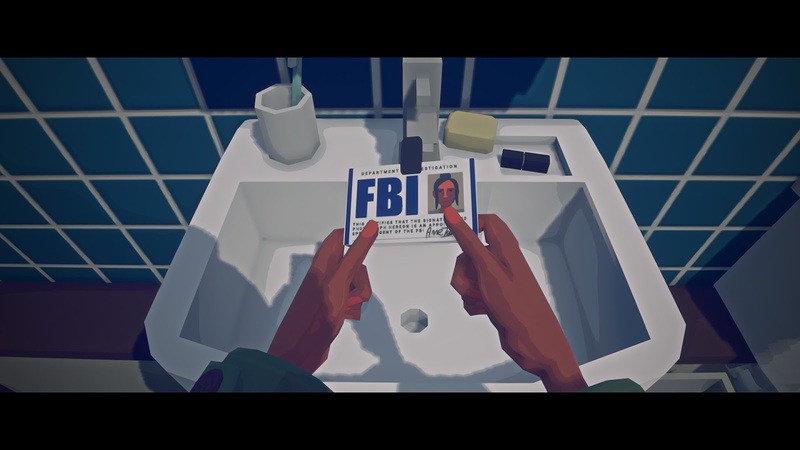 There is a lot of Lynch-inspired nods in the game, mostly from the fantastic Twin Peaks. The entire game is based around a simple small town that has corruption throughout. In one particular scene, you're hanging out with your FBI partner and you're listening to a woman in a red dress sing for a good minute, which is a direct nod at this scene from Twin Peaks. It's pretty interesting and gives you hope that this might lead somewhere. But it doesn't. The game is an interactive adventure, similar to the TellTale Games style of adventuring. You make some choices, you might click some things, and then the story continues. However in Virginia, you're clicking less things and never making a dialog choice because there's never any dialog. You still get an idea of what the characters are thinking by their actions which is one of the few charms of the game. But as far as actually playing a game, you're doing very little of it here. You play the role of FBI Agent Anne Tarver, a newly recruited rookie who's nightmares are blending between her reality and her dream world. Together with your partner, you're hunting down a missing boy from Kingdom, Virginia and uncovering the corruption within the other characters involved in the case. It's an interesting beginning that eventually gets into some trippy stuff that you have to reanalyze after the game is over. The problem is, a lot of it comes off as very pretentious rather than intelligent. And the ending is a complete let down. A big enough let down to feel like you just wasted two hours of your life. 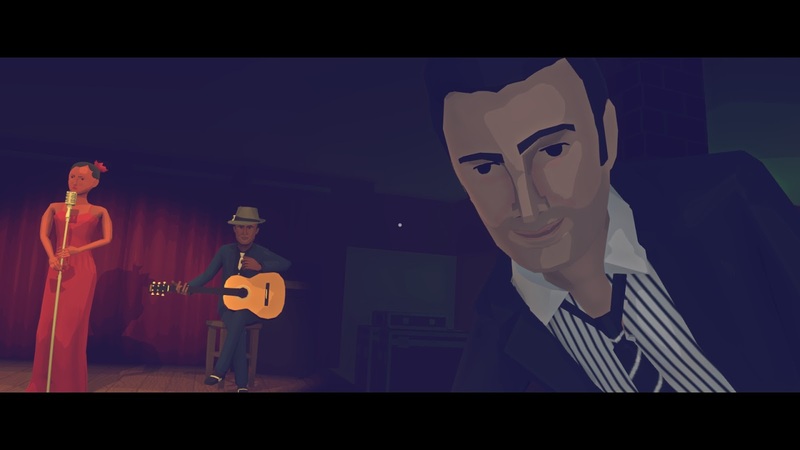 The game is played through a first-person perspective. Most of the actual gameplay is you clicking on an object in front of you or moving to the obvious next location. Since the game is very linear and straight forward, you don't really have a lot of reason to explore. The game isn't a technical wonder, but the low-poly graphics do look very nice in a retro-3D aesthetic sort of way. The surprising thing about this game graphically is while it's supporting polygons an old 3Dfx graphics card could handle (I kid! I kid! ), the game has some off-beat frame rate issues at points. Walking in a field makes the game crawl at a low 20 frames per second and sometimes even in the teens, which we know isn't very cinematic for a cinematic game. There's no voice work at all, and I think I prefer it that way. The musical score carries you through the emotions and development perfectly. You go scene to scene with a partner who clues you into whatever you need to do by pointing or just doing whatever needs to be done. To go scene to scene, there's a small pause before the transition takes place. It's important for this game since you're constantly going between scenes just like in a movie. One moment you're at your apartment and then the next you're in the office. Every scene has something you can mentally gather and examine later. It tries really hard to make you feel something, but what the feelings I was mainly left with were disappointment. There's a build up to something grand and disturbing, and it never really goes as far as your mind wants it to go. It's just a bunch of symbolism that doesn't go as deep as you'd like for a game—or interactive story—to go. While I didn't particularly enjoy this game, I think the concept is great for interactive cinema. I'd like to see another game copy this formula and tell an interesting story and include some more gameplay. For a brief moment, I felt like I was unfolding an interesting story and was having some fun. Then the weirdness unfolded and ruined the experience for me. I felt like I bought an abstract painting at an art show that was just a white line down a blue canvas. While I'm fine with examining art after it's completed like you do with an actual David Lynch piece, I felt this game tried too hard to be abstract and ultimate failed.